Royal Persian Coinage. ca. 450 to 330 BC. Rare type with Helmet on reverse die. Date : This type is though to have been issued between 420 and 375 BC. Reference : BMC Arabia #124. Size : 14.3 x 15.7 mm. Weight : 5.52 grams. Obverse : Persian King running right holding a bow in front and a dagger behind. 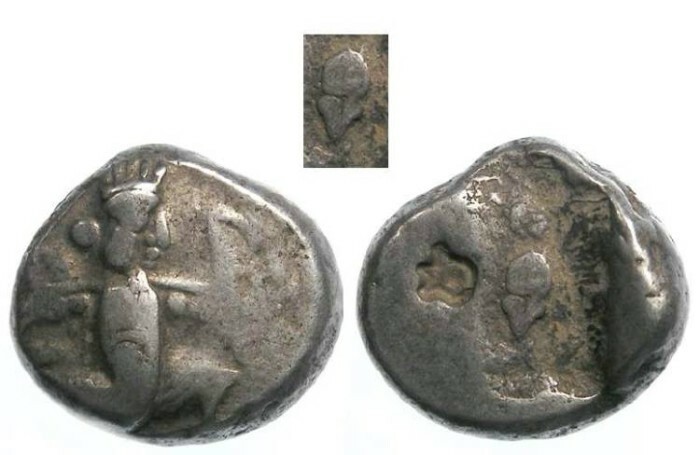 Reverse : Incuse irregular punch WITH A SMALL GREEK STYLE HELMET which was engraved into the die. There is also a clear banker's mark, possibly representing a flower. Examples with designs engraved into the reverse die are very scarce.